It's not canon until it aires. Then at that point, we can accept it or accept our personal doublestandards. The title of the thread. As I've warmed up to DSC, I've learned to be a little more flexible with canon in general. ST writers have tinkered with so many different things from TOS to the films to the series of the '90s, it just seems like a question of flexibility to some degree. If I misunderstood the gist of the question, I apologize. It is all canon, though I break elements down into distinct timelines. Similar events can happen in multiple timelines, like the five year mission. Broad strokes are mostly the same across most of the timelines, details are different. Galileo7 and KimMH like this. I had to reevaluate where TMP stood in all of this. After some thinking, I put it in with TOS. Just because it fits better with TOS than with Star Trek II- Star Trek VI. Star Trek: The Motion Picture takes place in a different universe than The Original Series. They are just too visually different to be part of the same universe. I've taken the op to mean what personal fan theories, speculations, facts from non Canon sources do you readily accept as being genuine or legitimate. Cullen Bohannon is an ancestor of Christopher Pike. Tim Thomason and The Old Mixer like this. Timeline A is separate from Timeline B, in that GR wanted to advance his own vision of Star Trek, free of television network constraints. In fact, it is implied in the TMP novelization that what took place in Timeline A was an exaggeration of the actions of Kirk and crew. I also make Timeline D distinct because of GR's opinion of those series of films. So, Timeline B, IMO, is the most authentic representation of GR's vision. Of course, Timeline C is based on the Rick Berman's guidance of the franchise, while Timeline F and Timeline G are, of course, based on JJ Abrams and associates' direction of the franchise. Of course, there will be overlap; key historical events will remain relatively the same, but the details are different (example: no ENT in Timeline B, pre-Temporal Cold War, but there is a starship Enterprise, NCC-1701 thru NCC-1701-D). The early invention of Transparent Aluminum leads to invisible airplanes. Jesus Christ is also an ancestor of Christopher Pike. 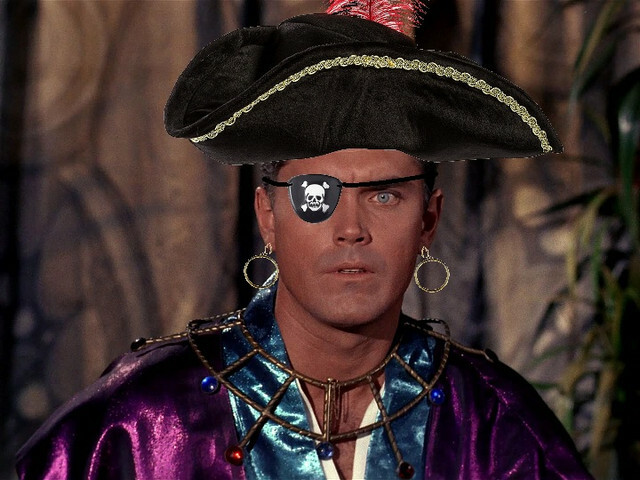 Every character that Jeffrey Hunter ever played was an ancestor of Christopher Pike, even the ones who died childless. Tim Thomason and BillJ like this. When offered the promotion to Fleet Captain, Pike resigns and travels to Orion to fulfill his real destiny. He takes Vina with him after using Tyler/Voq's Klingon doctors who know how to fix major shuttle crash injuries, since that is child's play compared to Klingons into humans surgery. Also, while Pike and Boyce spoke of being an "Orion trader," in my headcanon, we all know that's really a euphemism for "Orion pirate." King Daniel Beyond and Nyotarules like this. This is Star Trek canon, per 11:59. Toss in Evil Construction Guy from The Green Hornet, then. Kor, JonnyQuest037 and BillJ like this. Well, @Tim Thomason already touched on that above my post. Everything, and I mean evey permutation of Trek from the moment Pike and his "rescue" team beamed down to Talos IV to the latest episode of Discovery has been a collection of Talosian illusions! Pike, Number One and Colt never left by threatening suicide. In fact none of that first landing party returned to the ship. The left of the crew were tricked into beaming down and they and their descendents have been tricked into believing they have experienced galaxy spanning adventures. Kirk? He was actually just some lowly schlub on the sanitation team. But, like Walter Mitty, he did have a vivid imagination and the Talosians used as a template and focal point to distract other imprisoned crewmembers who were, in reality, attempting to rebuild the surface of Talos IV. Spock? He's actually explosively emotional and only wishes he could have more self control so the Talosians construct a fiction of an ideal society which whence he came. All the contradictions about technology, what it could and couldn't do? As Vina noted, the Talosians have forgotten how to repair their ancient devices. It's no wonder they might not truly understand how "alien" technology might work. Oh, I suspect they could extract knowledge from the technically inclined, but then it might get scrambled by the dullard who is Kirk who can, in reality, barely operate an electro-mop. The various encounters with g*d-like beings? Those are the distorted subconscious "cries" of the crew realizing they are trapped by a great mental power. The Talosians play upon this defiance, manipulating the "narrative" so that they "win", diverting their attention from the tragic reality of their imprisonment. Later series? Regarless of of their "in universe" chronology, the majority of them, at least the humans are descendents of Pike's crew and the Talosians are "rewriting" earlier scenarios, explaining why so many stories start to "repeat" themselves. While they may be powerful telepaths, the Talosians are not the most "creative". I mean, if certain illusions work to keep the crew and their children placated, they might as well use variations upon the same themes to keep later generations under control. In other words, all of Star Trek except for those first 15 minutes of the pilot is one hellish, repeated nightmare to manipulate and control a colony of slaves upon an alien landscape! Trek is really a half century long Twilight Zone story! OhMyOh. Your friend is a genius or demented. Prolly both. Do NOT like. Not a pleasant scenario to be sure, but it certainly and conveniently explains away every bloody inconsistency the franchise has ever presented.